As much as I love books, I hardly get time for them around my little monsters. Over the past few years I got myself quite a few (and even Hubby treated me to the whole set of my beloved Harry Potter), but my reading time always ends at reading Adam his bedtime story. When I got a chance to do this review through the Muslimah Bloggers, I thought this is a perfect opportunity - having a deadline meant I would have to make time for my own reading, no excuses! Well, I didn't really expect to get so hooked that I read it in less than a day! But oh my, it felt so good to read a book for my own pleasure again - and it would seem that I still have it in me to gobble up books like I used to. 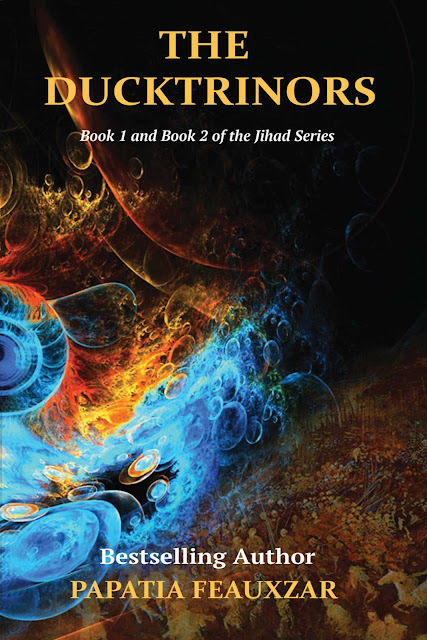 The book I was so enthusiastically reading was The Ducktrinors: Book 1 and Book 2 of the Jihad Series by Papatia Feauxzar. 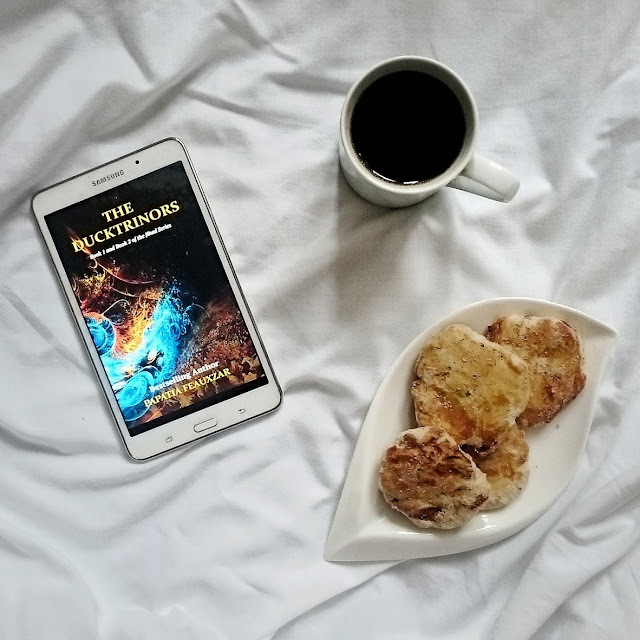 The Ducktrinors is a sci-fi novel aimed at Young Adults. The story is set in the dystopian future, in the times when the world is ruled by Seculars and open display of one's religious beliefs can get the person imprisoned, or even killed. It is a future so distant, that the 21st century is often mentioned as the "ancient history". Our main character is Hanifa Ducktrinor - a rebellious young Muslim woman. She believes that the end of times is near, and has a strong desire to visit Turkey and find the Ashab al-Kahf cave to join the fight of Jesus (AS) and Mahdi against Gog and Magog. We meet the Ducktrinors in Brazil, where they moved from South Africa, fearing persecution following Hanifa's careless actions. They are a typical practising Muslim family - they perform their daily prayers, observe Ramadan and Eids, they even have family halaqa sessions. Hanifa and her three siblings are also named after the four madhabs. But under the Seculars' regime they can't practise openly. The story starts on the first day of school, when Hanifa joins her siblings at the Castle 5, ran by Secular Deputy Sylas Yumaneter. Throughout the year she forms friendship, discovers many more hidden Muslims, and eventually joins the Seculars just to plot the rebellion from the inside and form the army ready to join her on her quest to Turkey. Well, it was actually my first encounter with Muslim fiction. Even though it's aimed at Young Adults and I'm probably out of this group by now, I really got hooked and have gone through the 500-odd pages in just few hours! What I liked, is that each chapter clearly identifying the scene, and the character whose point of view is displayed. The book is filled with Islamic references, cleverly tied into the story through Ducktrinors' conversations and descriptions of their halaqa sessions. Although we don't know the specific time setting, there are some strong indicators that the end of times is near: our characters having to hide their religious beliefs, women appearing naked despite being dressed, buildings so tall they seem to never end - to just mention a few. The book is a really engaging way to teach or remind the readers some basic Islamic principles. What I didn't like, was that at times I was getting slightly confused. Couple of chapters were like other Ducktrinor kids' childhood memories - while interesting and filled with Islamic references, overall they didn't seem to add anything to the story. Towards the end, when it's time for the battle between Hanifa's army and the Seculars, there are chapters filled with the additional characters' thoughts - I must admit that I kinds skimmed through those, they didn't really interest me and I just wanted to get back to the main story and find out what happened. At times I also felt like the writing was a bit rushed, like the stories of particular chapters were explained really briefly. But then, towards the end of the book, we finally get all the explanations - and even a little plot twist thrown into the mix! Overall, it was quite a good read. I'd say it's suitable for young readers aged 14-15+, due to mild sexual references and violence. Apart from the few short parts I chose to skip, the story is really engaging. It's an interesting vision of the future close to the end of times, also reflecting on the current state of Muslim ummah. We have all sorts of futuristic concepts, including teleportation device and even time travel. There were a couple of ideas there that reminded me of the Harry Potter series - could The Ducktrinors be its futuristic, Muslim equivalent? *I was sent an eBook for the purpose of reviewing. All opinions are my own.